For those of you who followed my adventures this week, you already know that I took it upon myself to attempt to find one unique item to eat in each land of the Magic Kingdom over the course of one day. Here’s the breakdown of how the day went and my personal thoughts. At park opening I headed straight for the Main Street Bakery. 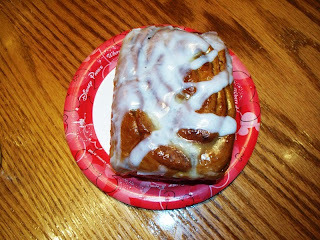 The cinnamon roll here was my target, and I was surprised to find that these pastries are served in square form, as most mental images of a cinnamon roll and other rolls available around property are round. I clearly did not grab enough napkins for this sticky start to my day, but the cinnamon roll, even though it was half the size of my head, was light, hot and delicious. If anyone is looking for a great way to start their morning, I highly recommend the Main Street Bakery, and more specifically, the cinnamon roll. After moseying around for a little while, I headed into Mickey’s Toontown Fair at its opening time of 10:00am. I grabbed some research information I had been looking forward to getting, and then headed to the Toontown Farmer’s Market. This is the only land where I made my exception to the hard and fast ITEM MUST BE UNIQUE rule, as there is very little to choose from in Mickey’s Toontown Fair. I opted for a green apple, which was harder than I expected, but juicy nonetheless. Within an hour I found my way to Adventureland and, with the lines for Aloha Isle not being incredibly long yet, I went ahead and picked up my third item, a Citrus Swirl. Longtime readers of the Gazette will undoubtedly know I have storied history with the Citrus Swirl. I remember the original orange concentrate version from Sunshine Tree Terrace, and had a longtime love affair with that particular treat. A few years ago the recipe shifted to an orange-flavored soft serve and, even more recently, was removed from the menu at the Terrace all together. The Aloha Isle swirl follows the most recent recipe using orange soft serve twirled with vanilla. It is still delicious, though it melts and shifts rapidly, so you have got to be quick. At this point I slowed down for a few hours before lunchtime. In the early afternoon I caught the first viewing of the day of Tiana’s Showboat Jubilee and then made my way towards Liberty Square and the Liberty Square Market. Here many of the same food items found in Mickey’s Toontown Fair can be found, such as fresh fruit, pickles, and hot dogs. The difference, and my goal for lunch, is the baked potato. 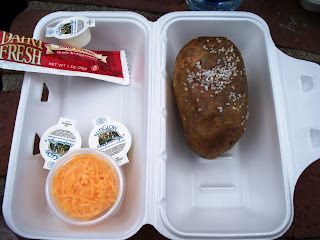 Served hot with sides of butter, sour cream, and shredded cheese, one of these potatoes is more than filling enough for lunch, and one of the cheaper options around. The afternoon became a little more slippery with the hours getting shorter and the menu items getting bigger. In Tomorrowland a quick stop in at Auntie Gravity’s for a tropical fruit smoothie was a cool way to beat the heat. The flavors of the smoothie may have seemed like a better fit in Adventureland, but the well concocted beverage was a great energy boost in the sluggish afternoon hours. In Fantasyland, I found my biggest challenge. With a menu seen throughout the Magic Kingdom in Pinocchio’s Village Haus, I set my stomach on Mrs. Potts’ Cupboard. The problem here is that, when searching for a unique item, you have to go big. 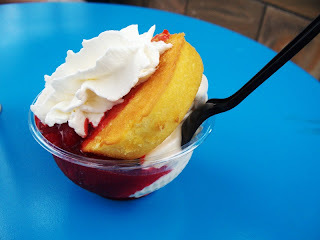 The strawberry shortcake sundae seemed the most appealing, and while the cake was a little hard to swallow with my already bulging belly, it was definitely a treat I would eat on a lighter fare day. 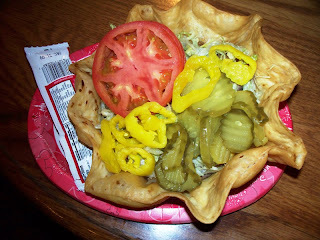 Dinner for the evening came in the form of a taco salad from Pecos Bill Tall Tale Inn & Cafe if Frontierland. The choose-your-own-adventure dining option comes complete with a taco shell, seasoned beef, and sour cream. From there, the salad is what you make of it, picking selections from the fixins’ bar that includes onions, cheese sauce, mushrooms, tomatoes, lettuce, salsa, cheese, pickles, and banana peppers. I tried not to pile my own salad too high, but I did want the full experience, so I grabbed a little bit of everything. This was a great meal, the shell was not as greasy as one would expect, and the toppings were all fresh. My only complaint, however, is that this is one of the more expensive items on the menu, but all that guests really get for their money is the shell, meat, and sour cream. For several dollars less, the same toppings are available for a burger and fries. In looking back on the experience, this is definitely one I would try again, although with a little tweaking. I dined upon a lot of smaller items in the morning, but had my heaviest items in the afternoon and evening. On future attempts, I would try to shuffle around the order in an effort to balance out the amount consumed. I have found some great treats and hearty prospects for meals that I haven’t tried before and, overall, had a great time filling myself up. Maybe next time we should get a group together and eat our way through the Magic Kingdom? An excellent round-up! However, I found it a little surprising that you consider the taco salad to be the more expensive option. We considered it a really good value, especially since it's hard to find a counter service combo for less than 8 bucks. But then, we usually split 2 among three people. And it's a pleasant change from burgers and fries. Now I want to try that strawberry shortcake! Yum!